Sweet Jamaican Secrets are so meant to be SHARED…. You all know that SNOW makes me think WHITE SAND BEACHES! This slide show is all about the SWEET Jamaican Secrets of Secrets Wild Orchid and Secrets Saint James and some shots I captured while there last April! Views from all around! Now remember when viewing that they had just opened… AND here is the GREAT NEWS! Leoopardo Laptop and I are headed back for Jammin In Jamaica the Face Book Bash! WE CAN’T WAIT! Sweet Jamaican Secrets are SO MEANT TO BE SHARED! Hope you enjoy the little slide show and if its snowing where you are it takes you away to your happy place…until you can stick your toes into the sand and say AH! Hate the SNOW and LOVE the SAND! So its snowing in B’more and of course that makes me think of SUN, SAND and Secrets Sanctuary Cap Cana! Here is a little something that takes me back to SWEET SECRETS that I shared at Secrets Sanctuary Cap Cana last January! They remain in my heart and I love to share them… Afterall aren’t SWEET SECRETS meant to be SHARED? Sundays are made for SIESTAS and the sweet dreams that come with them! Just LOVE my SUNDAY SIESTAS! They always seem to bring me the “SWEETEST of DREAMS” along with MARvelous Memories of visits to The Zoetry’s, NOW, and SWEET SECRETS! I decided when I woke up just now to make a little slide show with some FAV pics of the AMazing AMResorts I’ve Visited and LOVE. There are beach pics, tropical pics, sunrise pics, sunset pics…pics that make me smile and want to go back and LIVE THE DREAM! Yes, Sunday Siestas make me smile and the dreams that come with them make me long for more AMazing AMResorts Adventures! Today while doing some clean up on “BIG Leopardo Laptop” I came across so many SWEET MEMORIES! Memories that brought back smiles, and laughs and tears and SWEET DREAMS! This batch is all about SUNscape Casa Del Mar that I had named “SUNscape Casa Del MARvelous”…it was a magical and special time that I LOVED and now that it is DREAMS LA ROMANA I still LOVE IT! What makes it so special for me are the staff and management and the fact that many are still there! They keep the MAGIC ALIVE! And they make DREAMS come true! They live in my heart even when I am away from them! I hope that this little slide show will share some of the feelings, memories and love that I have for them! You’ll see pics of the AMazing AMResorts 5 Year Anniversary Party that I had been invited to and got to celebrate with the staff! There is even a pic of the construction of what is now bldg 3…that trip I was able to take pics and share them with folks who were having concerns about the construction that was going on! Leopardo and I loved being able to do that! There are beach shots, Food Shots, shot of the old theater that is now Restaurant Row and more! Hope you enjoy reliving the memories with me! If any of the pics inspire question please do feel free to reach out as I am always happy to share the SWEET DREAMS! 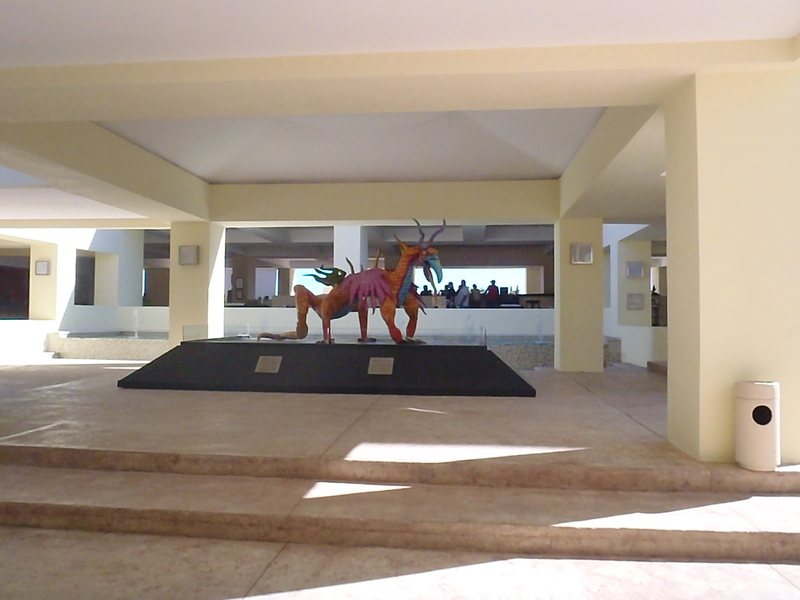 What is an ALEBRIJES you may ask.. These very popular figurines are carved from wood by hand and have a very nice history. The name Alebrijes was given by a Mexican Indian of the State of Oaxaca that once had a dream in which he saw strange animals made up of parts of one animal mixed with others, and those animals were making strange sounds that he could not understand. The one and only word that he could understand was Alebrije. Without knowing the meaning of that word he adopted it as their name. When he awoke, he took a piece of Copal Wood (which is native to Oaxaca) and started carving the animals that he saw in his dream. His animals are very similar of the ones we are presenting here. Creatively carved by the artists hand, no two pieces will ever be exactly alike. Each one a unique piece of art. 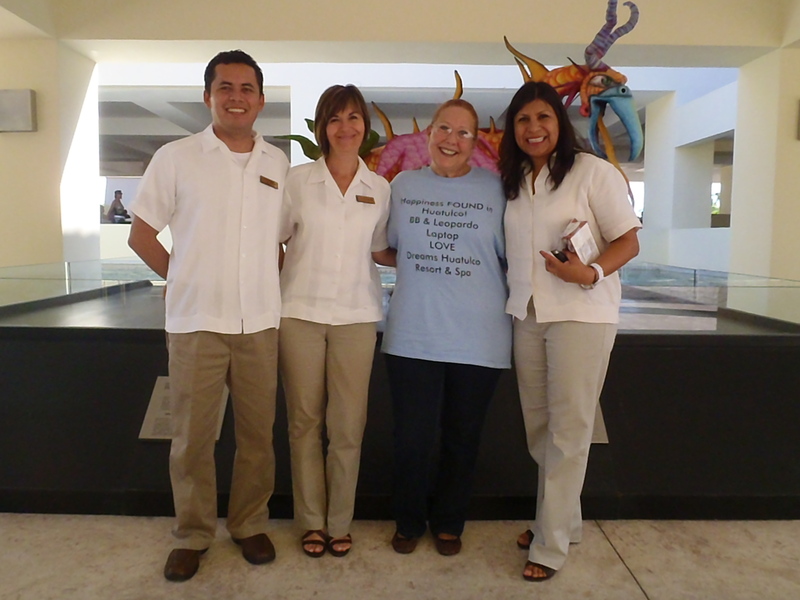 Dreams Huatulco has their VERY OWN! And he greets guests each day in the lobby! Loving all things Mystical, Magical and Special I was entralled by him! So imagine my suprise when I went back to my room on my first night to find my very own Leopardo ALEBRIJES waiting for me to guard my “Dreams” and Me! It was love at first sight! He is truly MAGNIFICENT! WE love the Magical Alebrijes of Dreams Huatulco and can’t wait to get back and visit him again…but til then we LOVE our Especial Leopardo Alebrijes that came home with Leopardo and me and lives happily in my living room and guards my DREAMS, SECRETS, Moments of NOW, and reminds me to LIVE with ART as at ZOETRY…and always appreciate all of my AMazing Adventures! 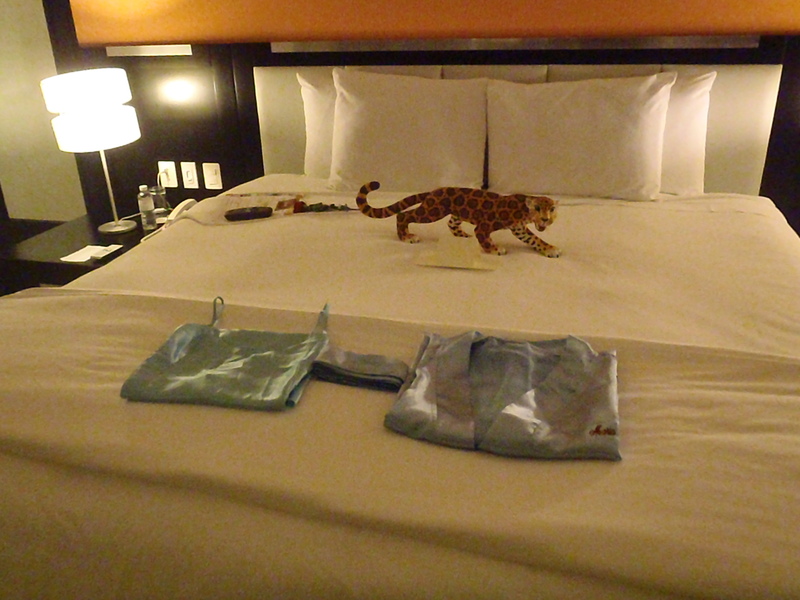 Leopardo and I love DREAMS Huatulco and the DREAM TEAM! And the AMazing Magical Alebrijes! Last night I took all of the “Happiness Found in Huatulco Pics” from Leopardo Laptop and put them into my portable Hardrive! So I can plug them in not matter where I am and check them out and share them too! Leopardo never likes that part…he doesn’t always share well…BAD Leopardo! hehehe! 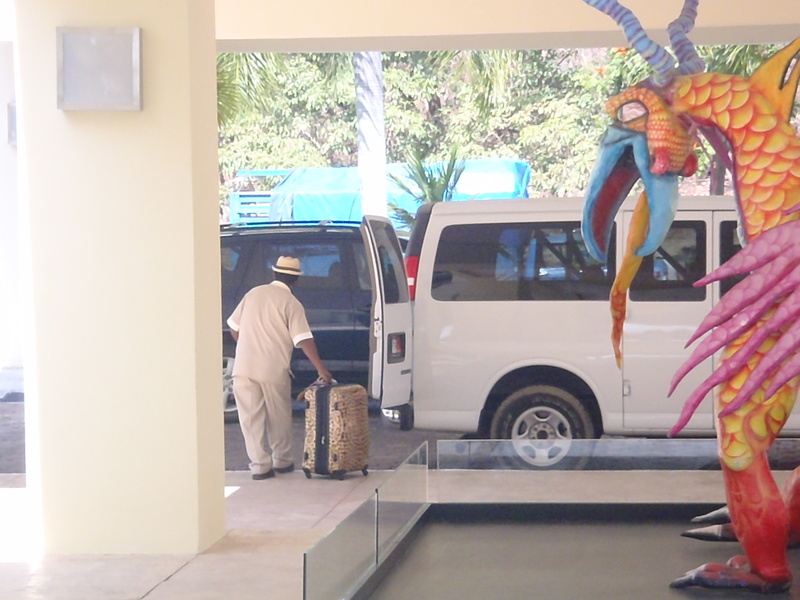 So I thought I would share this morning with you some of the parting shots I got on my last few moments there…the one above is the luggage being loaded into the van… I sadly watched as I sipped my last Mojito there at the Lobby Bar at Dreams Huatulco! But soon after that folks started showing up to say goodbye and wish me safe travels! So many of the DREAM TEAM came by…Pepe, Beatriz and even Angelica all stopped by to say good by to Leopardo and I … we were touched as we had fallen in love with “THEIR SWEET DREAM” and we did not want to leave! Then that is when Jane and John appeared to say Adios! It was such fun being able to be with them the night before and have a wonderful dinner with them and Glo and Joe on the Beach! Such fond and special memories and SWEET DREAMS I take with me in my heart! And I know that I will see them all again! My NIGHT @ Houston Airport! First…WOW WHATTA TRIP! And will be sharing more of that AMazing Adventure in future posts but wanted to check in and give you a recap of my travels from Huatulco to Houston to B’more…LOL! 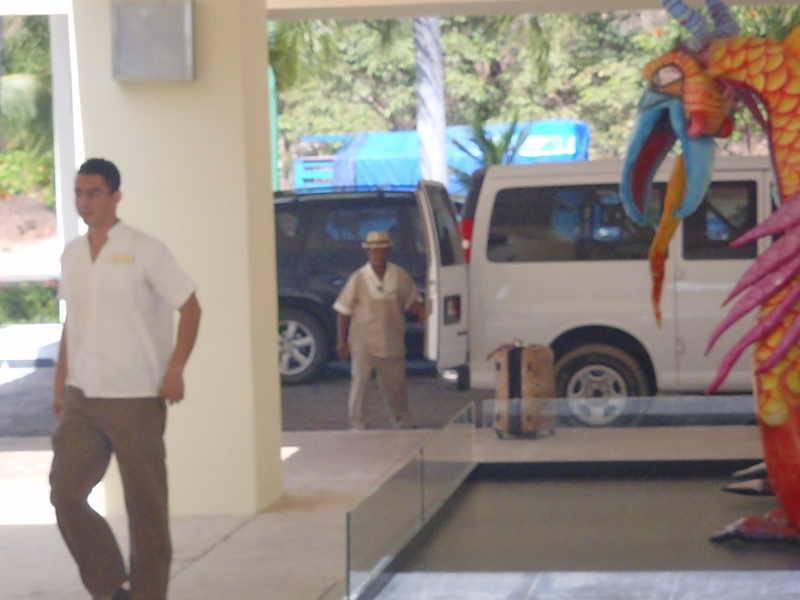 The drive from Dreams Huatulco to the Aiport was great! Everett was sweet enough drive me and we chatted the whole way there and then he helped me get checked in and waited with me for borarding. LOVE HIM! He definately is one of my AMazing AMResorts SONS 4 sure! The plane ride was uneventful…I had a movie on my ipod to while away the time and lucky that no one was sitting next to me so it was sort of like first class (in my vivid imagination!) on an Embraer small plane… AND I had a delicous Bloody Mary and half of a Jamon (ham) sandwhich to keep me happy! All was very good in my little piece of the SKY! After all of that… I found a tram and got to the gate that was makred on the ticket only to find the agent tell me the gate had been changed! The tram driver took me to the new gate and alas…the plane had left 3 minutes ago! I was heartbroken…but the worse was yet to come! The pool Tram Driver then took me to the Customer Service Desk for Continental and there the wait and drama and DISAPPOINTMENT began! I waited and watched and saw folks get things like a FREE STAY at a hotel for overnight! AND FOOD and BEVERAGE VOUCHERS! So I figured I would get that too! But alas…that was not too happen. When I got to the desk, I was told for some obscure reason that I still do not understand nor agree with I was getting NOTHING! NOTHING! No hotel for me! No FOOD, NO DRINK! NOTHING! BOO on Continental! Til that moment I had been a fan but AT that moment I was shocked and “ticked”!!! I headed right to the BAR! LOL! AND then some more SHOCK! Remember now…I had been at DREAMS Huatulco where all drinks are INCLUDED! So I ordered a Rum and Coke and glass of water…afraid if I drank the RUM and Coke down I would FALL DOWN! LOL! Well the RUM and COKE was so minisucle…it would have fit in a thimble! And when she told me $9 I asked if there had been a charge for the water…and she laughed and said no the water is free but they had just recently raised their prices and she was not happy either with charging that much as it seemed to be cutting into her tips! Well after that I headed down to the baggage claim area with my 2 carry on bags and headed out to the bench to smoke! YES, I know…I smoke…but I always try to be considerate and not infringe on others around me… Anyhow I found a bench and 2 disgruntled airline employees and we had a RANT Session for a bit! LOL! It helped! LOL! Then back into the Baggage Claim Area and found a seat near a wall with an electrical outlet and ensconsed myself for part of the eveing! LOL! I charged my phone and my ipod touch! Whated “Eat, Pray, LOVE”, played “Angry Birds” Solitare and listened to some Frank Sinatra! And took some cigarette breaks! Good thing I still had some snacks with me there wasn’t too much open down there! I napped comfortably with my leopard neck pillow I use on the plane…and this was my “DELUXE Accomodations” NOT in the SKY! I lived through it to go back up around 5AM and then have to go through the Check in screening…and swear I almost stripped down…they kept asking about pockets and this and that and my last nerve was GONE and thought mmm…maybe if I just strip down to my B’day suit that will show them…but I was affraid I might frighten the children who were there! After all Beached WHALES are not a common sight at the Houston Airport! LOL! Then back up to C concourse and breakfast and coffee from Starbucks! BTW they have some GREAT OATMEAL on their menu! LOVED IT! And of course their coffee…a Caramel Machiato with an extra ESSPRESSO! Thank you very much! Then wait for the ticketing agents to arrive! After telling them my story…and getting NOWHERE …they told me my bag may or may not be on the plane! The girl from the night before ASSURED ME that my bag was there in Houston and would be on the plane in the morning! NOW here it is morning and the ticketing agent could tell me SQUAT! GRRR on Continental! Boarded the plane which btw was PACKED and set in the middle of row 25….like a SARDINE! TRULY I am a big girl…and the gals next to me were too! So it was a tight squeeze! Thank goodness I had my ipod and another movie! Lost City with Andy Garcia…I do love me some ANDY! And another Bloody Mary this one $7 lol! A few little winks of ZZZ and we arrived in B’more! Upon getting home I kissed the cat, got a quick cigarette or 10 and watched my soap operas that I had taped while away… I needed some BRAINLESS time and it seems to have worked. I feel much better the TRAUMA seems to have passed and NOW I have only the FOND Memories of DREAMS HUATULCO and SWEET DREAMS! MORE of those wonderful memories will be shared SOON!